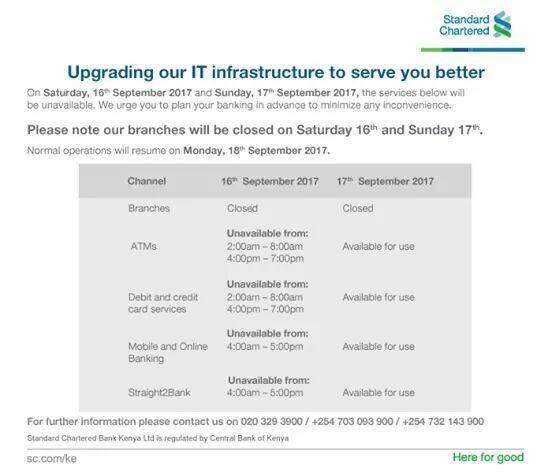 Standard Chartered (SC) Bank of Kenya will be upgrading it's IT Infrastructure this weekend running from Saturday 16th to Sunday 17th September 2017. Customers are therefore urged to plan early as most of the services will not be available during the upgrading period. All branches will be closed on Saturday 16th and Sunday 17th but will open doors on Monday 18th September. ATMs Debit&Credit Card services will be available as from 8am to 3:59pm on Saturday. The same will be unavailable from 4pm to 7pm after which the services will be available again. Mobile and Online Banking, Straight2bank money transfer service will be available from 5pm on Saturday. On Sunday 17th September, all services will be available except bank branches which will open on Monday. SC Bank is taking the move to serve it's customers better.